I've shared a triple tutorial on my Crafty Little Things UK channel on You Tube today showing how to make this trio of spookily cute gift boxes. 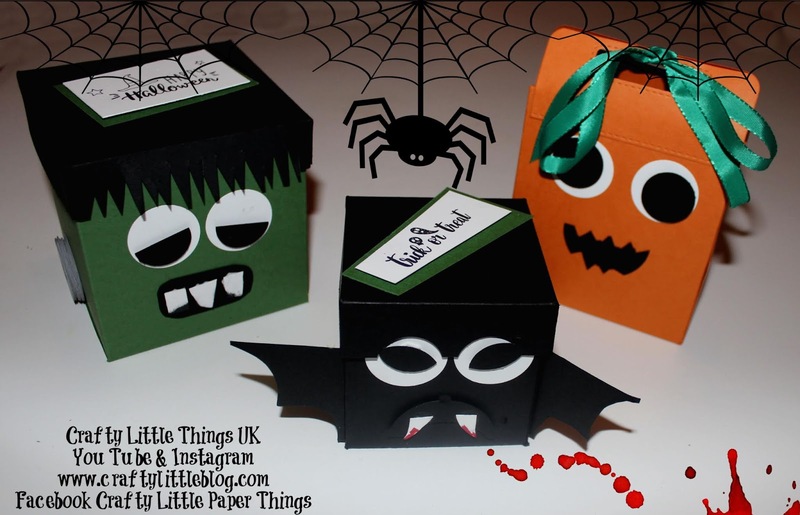 I thought I'd enter these fun little guys into the Positively Papercraft Halloween challenge which I don't imagine for one minute I will win with these but I thought would add a little fun to the fab giveaway. If you've not had a go yet head over to Positively Papercraft on Facebook and submit your Halloween entry. There are a few gorgeously spooky designs already entered which put my super simple efforts to shame. However, that said, the whole point of these three chaps is to show how easy it is to make something cute and fun from paper without having too many tools or too much specialist stash, such as stamps and dies. Some good quality Stampin' Up! cardstock in a variety of fabulous colours was all it took really to create these little things, perfect for spooky or sweet gifts. I used the Stampin' Up! shades of Pumpkin Pie, Garden Green, Whisper White and Basic Black with some retired Emerald Envy ribbon and I even added a touch of Real Red to the fangs. I used a 1 inch and a 1 and a quarter inch circle punch to create eyes and fussy cut other bits and bobs to create the effect of the three spooky chaps. Thanks for dropping in and do give the challenge a go if you have time, there are tons of lovely items in the giveaway.